TORONTO -- There have been two big changes in his life since he won the UFC's middleweight title from long-time champion Anderson Silva in Las Vegas in July, Chris Weidman told a crowd at Maple Leaf Square gathered for the UFC 165 weigh-in. He has a lot of people presenting him with a lot more business deals. And that might have something to do with the other big change in his life that Weidman mentioned. 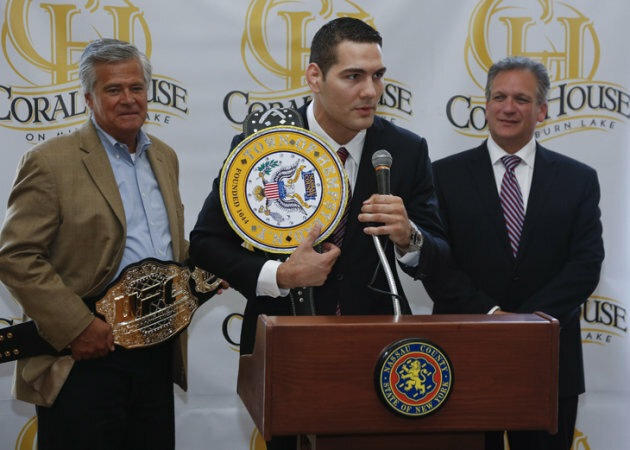 "I've got more money now," Weidman said. "That's probably the biggest thing. It's nice." Weidman was asked about the $41.5 million guarantee that boxer Floyd Mayweather earned in his fight with Canelo Alvarez last week, and whether he was bothered by it. He said he was happy for Mayweather and joked, "I'd like 45 million," but he took trouble to point out he had no issues with his pay. "I think we're treated great," Weidman said. "There are a lot of things, the bonuses they hook [us] up with after. I can't tell you ... Basically, I ain't complaining. That's all I am saying. As much as everybody thinks they know, you don't know." UFC president Dana White can expect to be asked a lot about Mayweather's purse in the coming weeks, particularly since there is a chance that Mayweather could net $100 million before it's all said and done. But White, who has fought back hard at insinuations that the UFC underpays its fighters, had an answer ready when he was asked about it Thursday. "You know, 13 years ago, people were asking me, 'Will there ever be a day when the UFC gets back on pay-per-view?' " White said. 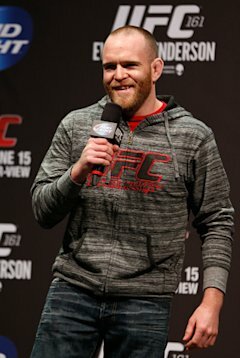 "[They'd say], 'Will there ever be a day UFC is on free TV? Will there ever be a day you'll be doing things in different countries?' Here we are now so, yes, I like to believe we will [one day pay a fighter that kind of money]." UFC lightweight contender T.J. Grant, who's now had to pull out of two title fights because of a concussion, said Friday he hopes to be able to begin training in about a month. "I'm getting a lot better," Grant said. "I'm not 100 percent yet, but every day I'm getting better and better. I'm hoping I'll be ready to start training in about a month. That's just me being optimistic, but I'm just hoping you know. There is always a chance I could have been ready for this fight [on Dec. 14 against Anthony Pettis], but at the same time, I couldn't accept it not knowing the future and not knowing how fast I was going to heal." Grant said his symptoms are improving, but that he is still not symptom-free several months after the injury suffered while training jiu-jitsu. "It's been headache pressure, fog, like pressure in the head," Grant said of his symptoms. "Earlier on, it was a lot more than that, like nausea. Concussions just affect you with everything. They affect your level of happiness. You can't do the things that make you happy. You're easily confused. It's a lot of different things." 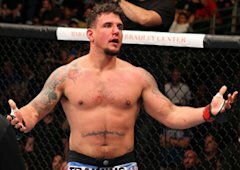 It's almost hard to believe, but White said Thursday that the onus is on former UFC champion Frank Mir and ex-Strikeforce champion Alistair Overeem to win when they meet at UFC 167 in Las Vegas on Nov. 16. Mir has lost his last three fights and Overeem has lost his last two. The loser, White said, will be cut. But here's betting he'll re-think that. Assuming both men want to continue fighting, they're both fun fighters to watch who will strengthen any card they're on. Clearly, fighters need to win or the ax inevitably will fall, but other fighters have hung around with longer losing streaks. I'm willing to guess that ultimately will happen with the Overeem-Mir loser.